Story: Rantanplan is the prison guard dog who often follows Luky Luke and Jolly Jumper on their travels. While Luky Luke is faster than his own shadow, Rantanplan must be said to be dumber than his own shadow. Background notes: When René Goscinny started working on the series Lucky Luke in 1955, the series rapidly changed from being a solid western to being the classic we know today. 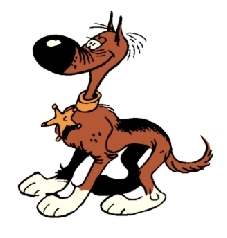 The guard dog Rantanplan was created as a spoof on the smart dogs from Hollywood like Rin Tin Tin and Lassie, and he soon became a recurring character in the series. In the vein of Peter Sellers' version of Inspector Clouseau, Rantanplan would have little or no clue as to what was going on, go in the wrong directions, get his head and other body parts stuck, and so forth. Rantanplan predates Inspector Clouseau by three years, so he is not inspired by Inspector Clouseau. In 1987, Rantanplan got his own series, running parallel with Lucky Luke. The series is still running with #19 published in 2010. Besides the series, a series of four albums was published for the company BP France from 2002 to 2004, and a few additional books have also been published. Rantanplan did not occur in the first Lucky Luke cartoon from 1971, but he appeared in the second cartoon La ballade des Dalton from 1978 (voice by Bernard Haller), and has been a regular in the cartoons since then. In the series from 1983 produced by Hanna-Barbera, he was given the name Bushwack. When Lucky Luke was transferred to live action movies, it wasn't until the third movie, Les Dalton from 2004, that Rantanplan got a role (voice by Eric Métayer), and so far this is the only appearance of Rantanplan in movies. Several Lucky Luke games have been released over the years, the earliest record of Rantanplan appearing in games so far, is Lucky Luke: The Video Game from 1996. He has appeared in at least one more game, Lucky Luke: Wanted! for GameBoy Advance from 2001, and most likely he has appeared in other games. Only a few pieces of merchandise (figurines and stuffed toys) has been seen. - Foggy: Another inept and funny police dog.